At long last, I am finally posting! The picture above seems ancient, from way back in November–several centuries ago! Newer images will follow. Those of you who know me well will not be surprised to hear that I feel guilty that I haven’t written a blog entry to date. I promised everyone I would. There are two reasons for this. The first reason is that new experiences have been coming at us so fast and furious that there has been no time to process all of the information, emotions and ideas. The second reason is that we have been incredibly busy. Every minute of every day. I guess those two reasons are closely related, almost redundant, but all the more compelling for it. But I won’t bury the lead here. Don’t you want to know as you read this if our adventure is what we dreamed it would be? In a word, yes. YES! I won’t say there aren’t moments of stress (mostly due to our newbie status), but life on the road in our Airstream is everything we had hoped. Our little Airstream house is comfy and cozy. We have all the things we need including each other and, of course, Dakota. We are developing our routines and creating those comfortable expectations of life. And I have to say when I wake up in the morning, my first thought is tremendous happiness that we are here and there is much more ahead of us. We took off on our big trip on January 3rd. December was a month filled with preparations. We almost didn’t get to go at all…due to big snows in CT followed by thawing ground. The Airstream was very visible in our yard and, as with all small towns, much remarked upon. After the big snow and then the big melt, the Airstream was deeply mired in our yard. Many up and down the road said we would never get it out. Even if the ground froze hard so we could pull it, it would then be frozen in place. Popular sentiment was that we were…in deep trouble. But with a little help from a new friend and Jim’s innovation, we were able to finally extract it and move to safer ground. Safer ground was not without its own dangers as a dented bumper would attest. Our first destination upon leaving was the Airstream dealership (the Mother Ship) in Lakewood, NJ for some fine-tuning and repairs. Thanks to the patience and support of the team there, we were soon good as new. 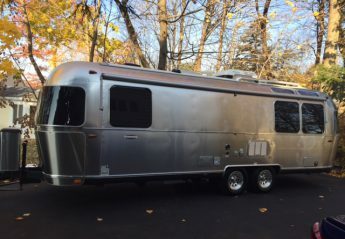 Because of the seasonal cold, the Airstream was still winterized. That means none of the water systems were working. We couldn’t use the sinks, shower or bathroom. Our original plan had been to de-winterize in Ashland, VA.
First lesson in life on the road, plans are made to be changed. The cold and snow dogged our heels. While we really liked the countryside around Ashland and our campground, horror stories of impending snow and ice forced us to flee south to Greensboro.